Heartless only runs til September 30. I hope I get to see it again because I doubt if it’s a play that’s going to be produced that much. But it’s a major contribution to Shepard’s body of work. It returns to one of his essential themes, the slipperiness of identity and how we’re haunted not just by our own past and family history but by the selves we might have been, the parts of ourselves that no one sees but that show up in our daydreams and our nightmares, the different selves that emerge in different contexts and different relationships. “Double nature,” Shepard called it in an interview about True West. “It’s a real thing, double nature. I think we’re split in a much more devastating way than psychology can ever reveal. It’s not so cute. Not some little thing we can get over. It’s something we’ve got to live with.” The doubleness shows up several ways in Heartless. All three of the younger women have a strange ever-shifting relationship to one another. Witness the character of Lucy, who is one of two sisters and one of two nurses. Sally treats her like dirt and speaks more affectionately to Elizabeth, who may or may not be a hallucination, the living representation of the murder victim who provided the organ for a heart transplant Sally had as a child. Lucy also has to compete with Elizabeth for her mother’s attention. Eventually she winds up running off with Roscoe – her attachment style, especially when she’s been helping herself to Mable’s pain-killers, is indeed loosey-goosey. Shepard fields these internal machinations masterfully, circumventing easy explanations or heavy-handed symbolism. 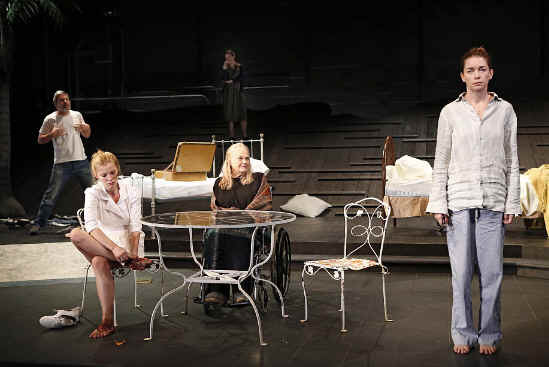 As a leap of writerly freedom, Heartless reminded me of Three Tall Women, the strong and original play with which Edward Albee pulled himself out of a decades- long slump and proved that there was plenty of fuel left in his tank.